One of my favorite memories is waking up to six inches of fresh snow on my birthday, October 10, 2007. We were staying in Leadville, Colorado the highest town in the United States at 10,000 feet above sea level. This small town provides a uniquely Colorado experience for several reasons. 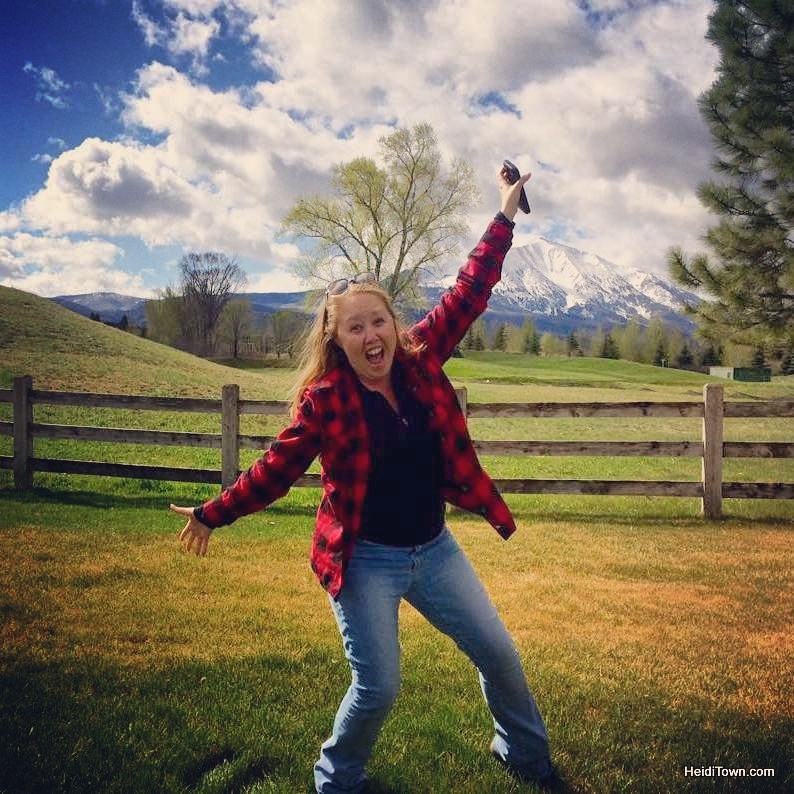 First, there’s no place like Leadville and when I say it’s one-of-a-kind, I mean it. Colorful characters, both past and present and colorful stories, both historical and modern day, plus lots of snow – that’s Leadville in a nutshell. 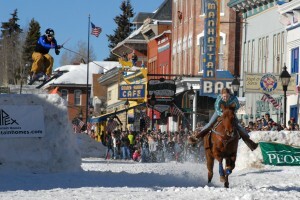 Leadville Ski Joring Weekend is March 2-3, 2012. Ski joring is the Scandinavian word for ski driving, and in Scandinavia individuals would ski behind reindeer as a method of transportation. More than a half century ago, two men from Leadville witnesses ski joring in Steamboat Springs and brought it back to Leadville where, in 1948, it became a serious competition. 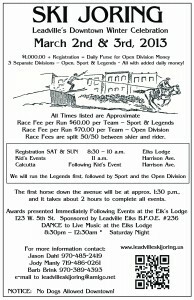 Today, the Leadville Ski Joring completion is considered the preeminent event in the sport and has a $1,000 purse. If you’ve never watched skijoring, you in for a treat – watch the video from PLUM TV at the bottom of this post to get a taste of what it involves. 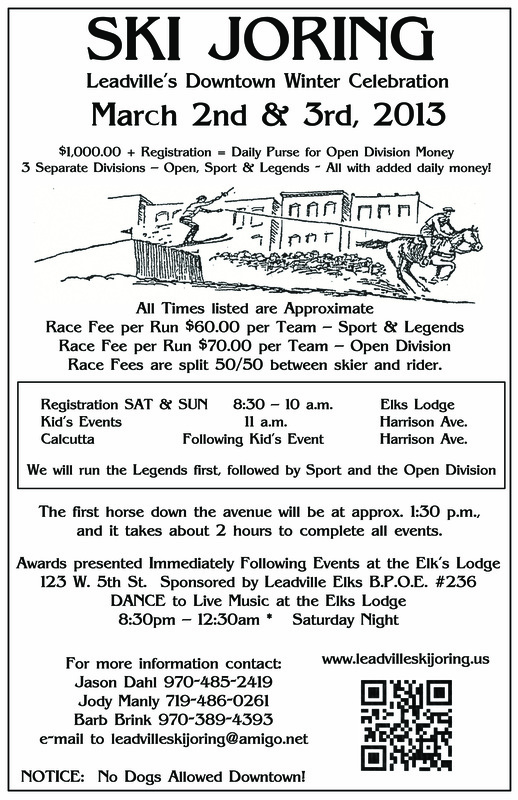 The event poster gives all the details on the ski joring events taking place in downtown Leadville. Click image to enlarge. 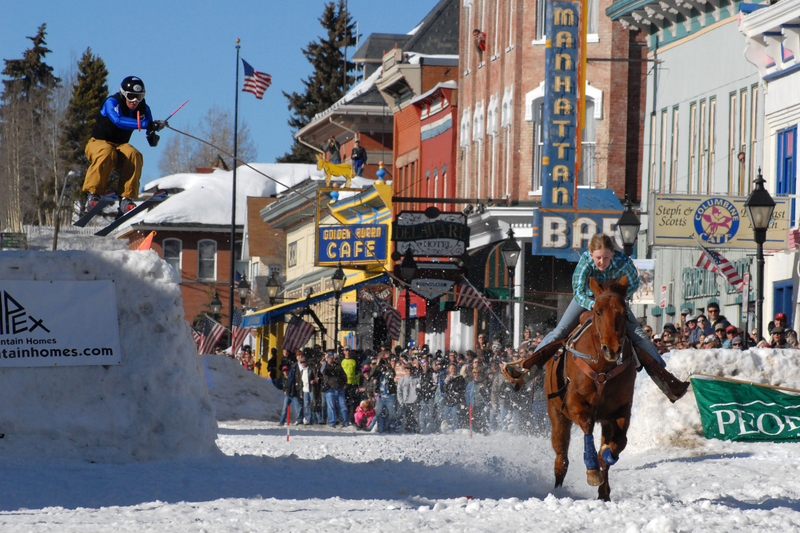 For families that choose to make a weekend out of the event, Leadville has much to offer in the way of wintertime fun. There’s the groomed, free Dutch Henri Sledding Hill where families can either bring their own sleds (no metal allowed) or rent tubes for $7 on Saturdays and Sundays from 11 a.m. to 5 p.m. The hill is open every day from dawn to dusk. There is also the 30,000 square foot outdoor Leiter Ice Skating Rink, an affordable way to spend the afternoon. Skate rentals plus skate time is just $3.25 for children and $4.25 for adults. Ice rink is open 3:30 to 9:30 p.m. on Saturdays and Sunday and includes a warming hut, snack bar and sound system. The Mineral Belt Trail is free, and is 12 miles of groomed trail for cross country skiing and snowshoeing. In fact, Leadville has a total of 50 miles of cross country skiing trails, including 12 kilometers of groomed trails on the golf course. The National Mining Hall of Fame and Museum is open 11 a.m. to 6 p.m. every day. This is the only federally chartered non-profit museum and if mining sounds boring to you, it did to me too. However, this museum is really impressive. My husband wanted to go and I tagged along, and I was so glad that I did. Find them online at MiningHallofFame.org. Poster JPEG is large file size (slow to display/download) and appears to be poor quality; for future reference, a (compressed) PDF would probably be better – in file size and quality. Oh! I missed that special Leadville Ski Joring event.How can I forget the amazing Leadville Colorado experience,Its like a dream city with a lot of snow ( as I love snowfall). At first I thought it has always been a kind of snowsports, but who knew that ski joring used to be a form of transportation too, a few centuries ago. I have seen this sports being played in official tournaments but only on television. I would very much like to view it physically though, as it sounds really interesting. If given a chance in the future, I might even participate in any open events. I think it is a fun activity which can be done as an entire family bonding activity too and the young children will definitely love the fun of sliding.